OK Gurus. 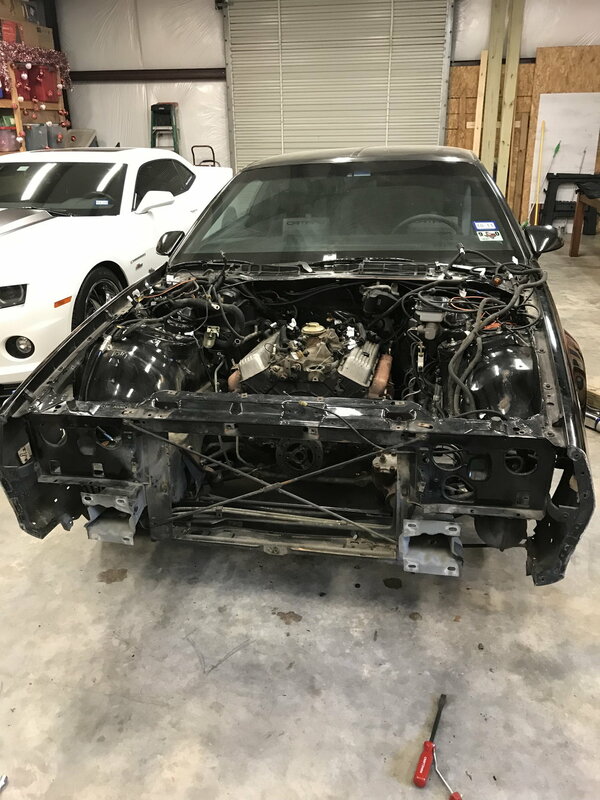 Need to remove entire front clip off my 85 IROC. Do fenders have to come off before I can remove clip? Any hints or procedures? What exactly are you trying to remove? Front clip usually refers to the front sheetmetal of older full frame vehicles or ones with removable sub frames, like 1st and 2nd gen f bodies. Since 3rd gens are unibody, the only bolted on, removable parts are the fenders, hood, bumper and bumper support and the k member. The rest of the front chassis is welded together. If your talking about the front bumper, theres 3 bolts on each side of the chin spoiler, a bunch of plastic push pins on the bottom of the impact bar, 4 bolts on the front of both fenders that connect them to the bumper, two that hold the black backets to the impact bar/rad support and the one in front of the hood latch. for the fenders its the long front bracket, 2 screws under the front gfx/emblem, fender bolts up top and the hood has to come off and obviously the wheel well liner. 91 Front End to 87-89 Front End. Convert 93-97 Front End to 98-02 Front End?